Journalism majors are strongly encouraged to get involved with the campus media. Students are welcome regardless of his or her experience. Since the campus media are student-run organizations, you cannot get academic or internship credit for your work, but you do get invaluable experience that can prepare you for future internships and jobs. Amherst Wire is the digital-first student-produced publication of the Journalism Department at the University of Massachusetts Amherst. We focus on topics of interest to today’s students, and our focus is on good storytelling, colorful multimedia, interactivity and fostering community dialogue on the issues that affect our lives. Anyone interested should contact editors@amherstwire.com. The Massachusetts Daily Collegian is published Monday through Friday during the University of Massachusetts' calendar semester. 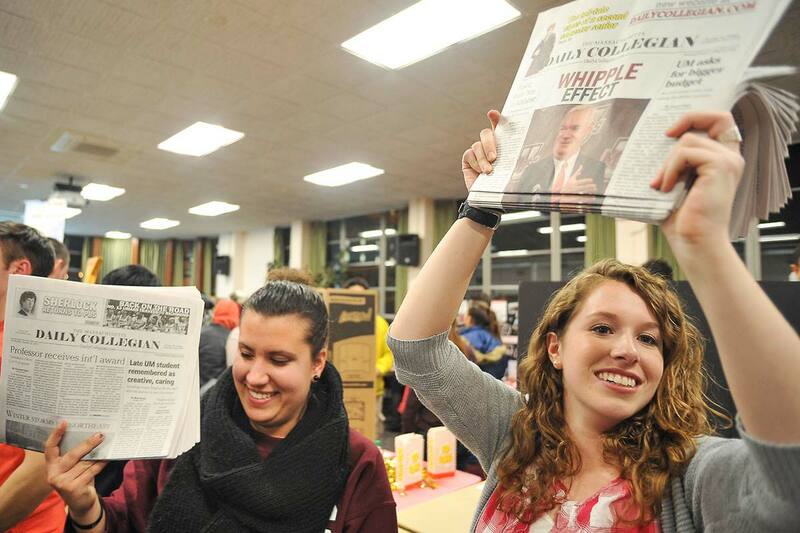 The Collegian is independently funded, operating on advertising revenue. Founded in 1890, the paper began as Aggie Life, became the College Signal in 1901, the Weekly Collegian in 1914 and the Tri-Weekly Collegian in 1956. Published daily since 1967, the Collegian has been a broadsheet since January 1994. If you're interested in working at the Collegian, email the managing editor at managingeditor@dailycollegian.com. UVC-TV 19 is UMass’ student-run television station. Its mission is to serve as a training facility for all facets of video production, while providing undergraduate students with a welcoming environment in which to learn. The station broadcasts 24 hours a day, seven days a week on HSCN Channel 19 on the UMass campus (and soon it will be streaming live online--so UVC will be available to watch from anywhere in the world). Membership is open to any undergraduate student currently enrolled at the University. To become a member, simply stop by the station to fill out a membership form. 91.1 FM WMUA is the student-run campus radio station. WMUA features music, news or sports departments that build radio broadcast, news writing and production experience. Interested in joining? Visit wmua.org to find out ways to get involved. It is the duty of the Rebirth Project to cultivate a digital magazine included with multimedia content that documents the activity, thoughts and experiences of students in attendance at the University of Massachusetts, Amherst, with particular focus on students of color as their interests connect to the broader local, national, and global happenings of the present. Through well executed journalistic, artistic, and technical practices we withstand the legacy that has come before us and work to inspire the future. "We are a UMass based magazine whose goal is to give students of color a platform to put their personal work out, and to provide a safe space for active and engaged discussion within the PoC community on campus. We work to give a platform to share creative writing, photography, art, poetry, and more from students of color. We also work to highlight local artists, business, and social media influencers. Our goal is to uplift people of color and provide a space for access and information on these people and to hear different voices." The Journalism Department supports a student-run chapter for the Society of Professional Journalists, an organization representing journalists and safeguarding free speech. We encourage students to become members of SPJ on the national level to reap the benefits of professional development, networking and staying on top of current issues in the field of journalism. All are welcome to general meetings of the UMass SPJ. Formed in spring 2015, the student-led JEDI group is a club housed in our department. The group was formed to address issues in journalism and develop student support systems within the department. Email Razvan Sibii to be on the mailing list and join the discussion on Facebook. All are welcome.